This guide is divided into four different sections – Controls, First Steps, and Features. 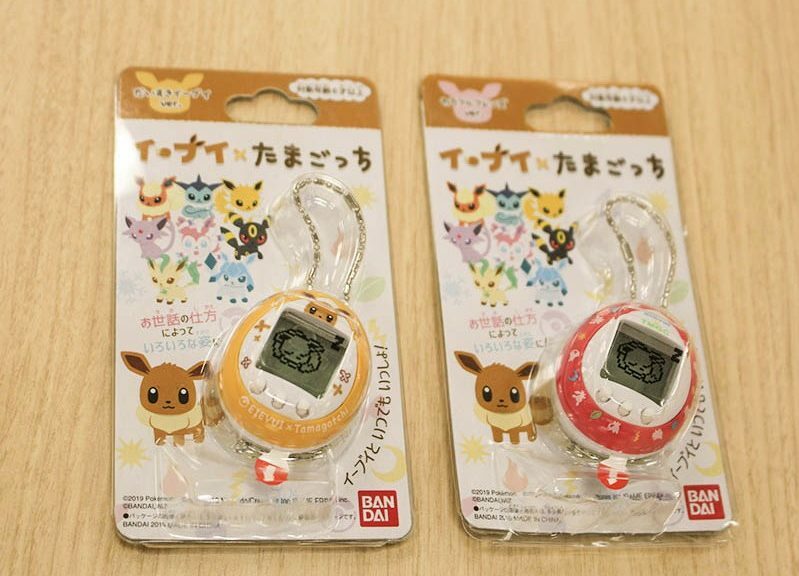 Eevee X Tamagotchi has three buttons – A, B, and C. A is the first button from the left, B the middle, and C the last button. On menus, A is used to select (move), B is for confirm (enter/accept/yes), C is for cancel (exit to default screen). There is a reset button at the back of the Eevee X Tamagotchi. To reset the game, you have to use an object with a sharp end such as a pen to push the reset button. It is extremely rare for players to reset unless they’ve just changed out the batteries. After unboxing your Eevee X Tamagotchi, you will have to completely pull out the string of paper that is attached to it. 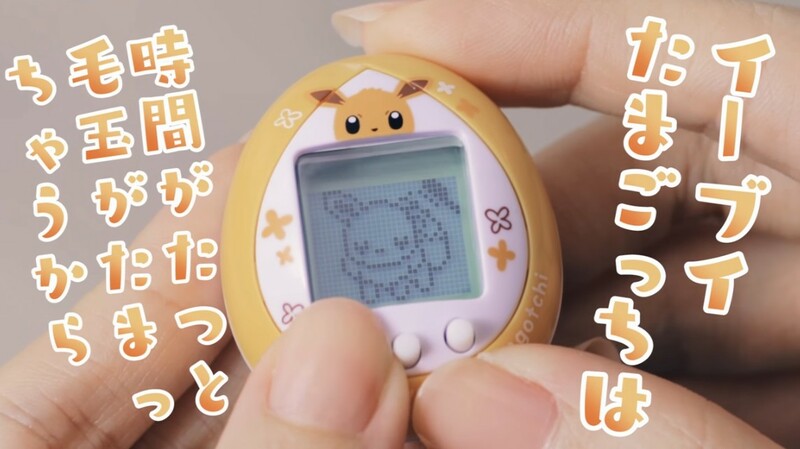 After the paper is removed, the Eevee X Tamagotchi turns on. You cannot turn off Eevee X Tamagotchi after turning it on – the only way is to removed the two LR44 batteries. Batteries usually last for a couple of months, so if you need to replace them simply grab a set from Amazon or buy it from a brick-and-mortar retailer. The first thing you have to do after turning it on is to set the time. To change the hour, keeping pressing the A button until you see the correct hour. Then, press B to move to set the minutes. Keep pressing the A button to set the correct minute. If you make a mistake or need to change the hour/minute, press C. Otherwise, press B and the time will be set (it’s possible to change the time during gameplay). Once the time has been set, an egg will appear on screen. After 20 seconds, the egg hatches to reveal Eevee, and the game begins. Eevee resides on the default screen, where you can see it moving about or sleeping. Kinomi Get is a game where you collect as many falling Kinomi as possible. Don’t let other obstacles hit you. To move the platform to the left, press A, and to move to the right, press B. Pressing C will leave the game. Achieve a perfect score by collecting 5 Kinomi. Dance is a game where you press the correct buttons. Eevee will dance for a few seconds, after which one or two alphabets will appear on screen. Press A if you see A, press B if you see B. If you see two alphabets, press the corresponding button twice. Achieve a perfect score by pressing the correct buttons at the right time. At different times of the day, Eevee will cry to tell you that its hungry or wants to play a game, so please take note! Besides feeding and playing with Eevee, Eevee will shed fur at times. This is where you have to brush Eevee. The fur appears on the default screen. To clean it up and groom Eevee, simply press the A button. You cannot clean up the fur and groom Eevee when Eevee is asleep. To check Eevee’s emotional state, press the C button on the default screen. You’ll be able to tell whether Eevee is happy or upset based on its emotion and body language. Depending on the types of activities you and Eevee take, Eevee will evolve into a member of the Eeveelution family or one of the secret Eeveelutions exclusive to Eevee X Tamagotchi. Learn how over here. If Eevee remains constantly sad, it will “die” by returning to the Poke Ball and say Bye Bye (バイバイ) to you. This happens when you ignore it for around 36 hours. That’s when Eevee starts to become sick after it has shedded its fur 6 times (you’ll see 6 fur balls). Death is a way for you to “kill off” unwanted evolutions. Press B to hatch another egg and Eevee reappears! That comes to the end of our guide! We hope this will assist you in playing Eevee X Tamagotchi. If you have any questions, please leave a comment below. Eevee X Tamagotchi is available for purchase on NintendoSoup Store. Thanks, Jack (for the fur ball death tip).